An indicator of trucking industry growth in Idaho is the number of job postings for tractor-trailer drivers. In 2012 and 2011 considerably more truck driving jobs were posted in Idaho than during the years before the recent recession. 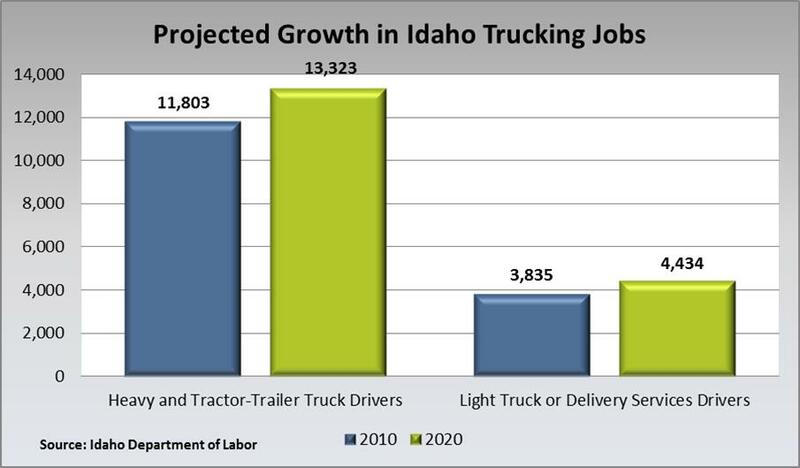 Projections from the Idaho Department of Labor support the notion of long-term job growth in the trucking industry. Between 2010 and 2020 the number of heavy and tractor-trailer truck drivers is expected to rise from 11,803 to 13,323, an increase of 12.9 percent. During the same period light truck or delivery service drivers are expected to increase from 3,835 to 4,434 by 2020, an increase of 15.6 percent. From 2003 to 2007 before the past recession, Idaho’s trucking industry demonstrated steady growth before driver hiring slowed in 2007 as the economy began to turn downward. There was a rapid decline in driver hiring the next two years. In 2009 demand for drivers in Idaho had fallen to about a fourth of what it was in 2007. From 2009 to 2011 demand from truck drivers nearly quintupled, from 648 to 3,145, and then slipped slightly in 2012 following the trend between 2006 and 2007 when driver demand stagnated before the recent recession. There was a marked decline in job postings during the final three months of 2012. Between the third and fourth quarters driving jobs fell from 967 to 564 compared to 806 in the last quarter of 2011. While this short-term job posting data raises some concerns, the long-term occupational projections show healthy job growth in the truck driving industry through 2020. Overall the combination of post-recession job listings and the long-term occupational projections provide a positive outlook for Idaho trucking, which could signal future economic growth.